Plate 24 from the second set of Thomas and William Daniell's 'Oriental Scenery'. 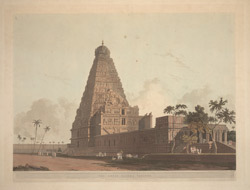 The Brihadishvara Temple of Thanjavur was patronised by Rajaraja I of the Chola dynasty around AD 1000-10 and is one of the greatest architectural achievements of South India. The temple stands in the middle of a large rectangular court and is entered on the east side through two gateways. The pyramidal tower of the main shrine is around 60 metres high and is covered with intricate sculpture. The mandapa seems unfinished, while the entrance to the temple proper is an addition of the Nayaka Period.